Let's Encrypt just got stable from beta. Let's Encrypt is a free, automated, and open certificate authority brought to you by the non-profit Internet Security Research Group (ISRG). Although they only offer certificates with 90 lifetimes, but hey it's trusted and zero cost! This guide is written for one-click Ghost installation instance on Digital Ocean, for automatically enable HTTPS on your website with EFF's Certbot, deploying Let's Encrypt certificates. You need to use git later to install the client. Make sure it has nginx version: nginx/1.10.0 or later. If you're using outdated version of Nginx, update it. First, you need Certbot, previously the Let's Encrypt Client. You have 2 options to get the client. I recommend you get it from Github and put it in /opt directory. In this guide, I'll display the demo of using the Certbot's webroot plugin. Let's make sure .well-known, the webroot directory is ready for validation from Let’s Encrypt validation server. Add the following location block to inside the server block of your Nginx configuration, to ensure that files inside /.well-known/acme-challenge are served by the Nginx. This is a useful and handy command to check if nginx configuration has any syntax error. Try to validate the configuration every time after you make changes. Reload nginx, run nginx -s reload or service nginx reload. The following command will also install Python if not previously installed. Here are some screens you might see. 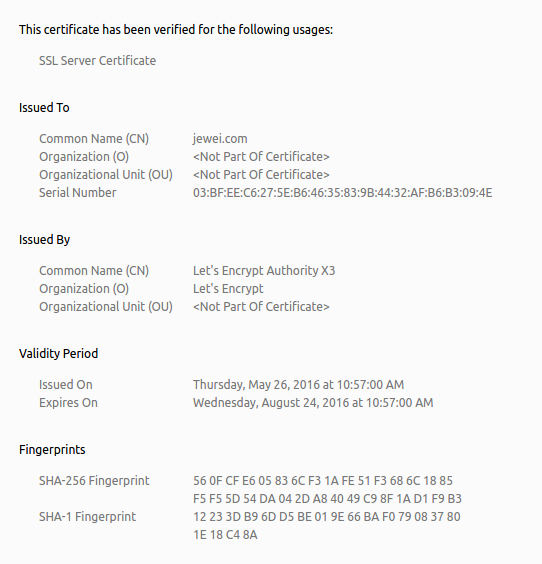 In the above example, you'll find the certificates inside directory /etc/letsencrypt/live/jewei.com/. You can build a more secure Diffie–Hellman key exchange for better security. Let's generate a 2048-bit Diffie-Hellman Group. The generation will take a few minutes, after that you will have a strong DG group at /etc/ssl/certs/dhparam.pem. Now you have the SSL certificate, you need to configure Nginx to use it. Create an Nginx snippet at /etc/nginx/snippets/ssl-jewei.com.conf. Create another snippet at /etc/nginx/snippets/ssl-params.conf. The snippet above is taken from https://cipherli.st/ to provide Strong SSL Security for all modern browsers. They set a strong Forward Secrecy enabled ciphersuite. Let's include the snippets to Nginx configuration like the example below. Now, reload or restart Nginx for it to take effects. 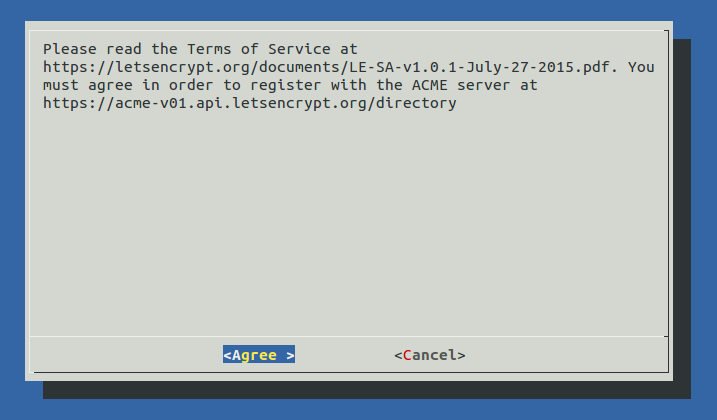 The Let's Encrypt TLS/SSL certificate should be now in place. Get yourself a cup of coffee, wait... read below first. Run this command to see if http_v2_module is enabled. If you're using Chrome browser, install HTTP/2 and SPDY indicator plugin so you can verify if you have the blue thunder icon like below. Also notice the green https lock to the left of the domain in URL bar. Clicking the lock for more information can see the following details. 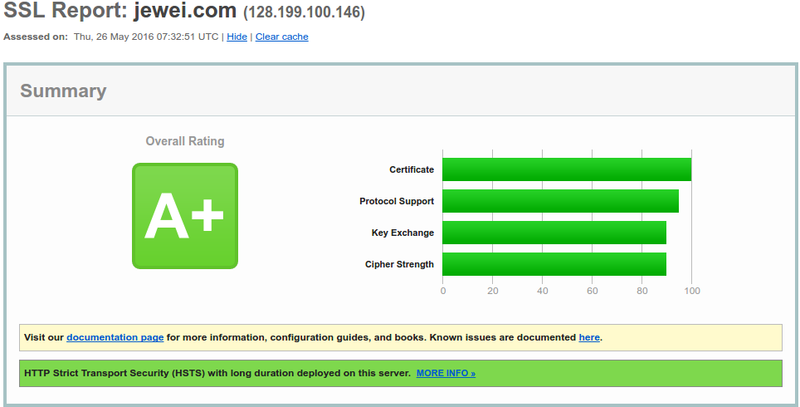 You can even check how strong your SSL doing with www.ssllabs.com. The following is a screenshot of part of the report. You can checkout the full report. Let's Encrypt certificates expired after 90 days, so it's logical to renew them automatically. Create a config file under /etc/letencrypt/cli.ini. Create a renewal script and put it in the cron, /etc/cron.daily/certbot. Note it's in the daily cron as recommended by Certbot. Note: if you're setting up a cron or systemd job, we recommend running it twice per day (it won't do anything until your certificates are due for renewal or revoked, but running it regularly would give your site a chance of staying online in case a Let's Encrypt-initiated revocation happened for some reason). Please select a random minute within the hour for your renewal tasks. Yes they suggested it to run twice per day. Now you should be able to leave it in peace.